VietNamNet Bridge - According to Major-General Le Van Cuong, China's unilateral actions to control the East Sea, use of its fishing fleet to disturb the sovereign waters of Vietnam will continue, at increasing levels. 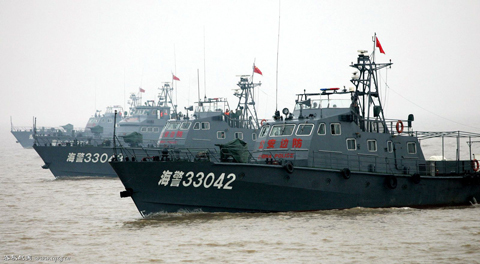 The patrol boats of Chinese marine police. Photo: Cqzg. Major General Cuong, former Director of the Institute of Strategy (Ministry of Public Security), said he was not surprised about the incident in which a Chinese fishing vessel cut off the cable of Vietnam’s Binh Minh 02 ship, and the activities of the Hainnan Island authorities in controlling fishing vessels of Vietnam recently. According to him, with the strategy of dominating the East Sea, but not wanting to drop the "mask of peace," China will activate the fleet of tens of thousands of fishing vessels into the East Sea, particularly the continental shelf and the exclusive economic zone of other countries. Chinese fishing ships always go into large groups so that small fishing vessels of Vietnam cannot compete with them, even in the waters of Vietnam. According to Cuong, this is the policy of using power to bully others. Using this trick, China will not use the armed forces but it can still monopolize the exclusive economic zones, robbing the assets of other countries including Vietnam. “In the coming years, China will continue to develop in this direction," General Le Van Cuong said. Cuong said, even Japanese experts recently told him that even this powerful country is also afraid of Chinese fishing boats. Japan did not dare to use its warships because they are afraid that China would say that Japan uses warships to crackdown on civilian ships. Meanwhile the law enforcement forces cannot prevent all abuse cases by Chinese ships. Vietnam's situation is similar when its marine police force is small while the fishery control force has not been established. Hainan authorities recently allowed its police force to “get on board, seize and deport ships that make unlawful interference with the waters of the province." Representatives of the Vietnamese Fisheries Association said that this is the violation of the International Convention on the Law of the Sea 1982 (UNCLOS 1982) and the sovereignty of Vietnam. "This action directly affects the Vietnamese fishermen since it will allow Chinese forces the right to prevent, arrest Vietnamese fishing vessels which are fishing in the sovereign waters of Vietnam. The association strongly opposes it," Vietnam Fisheries Association’s chairman Vo Van Trac said. The location where the Binh Minh 02 incident occured. 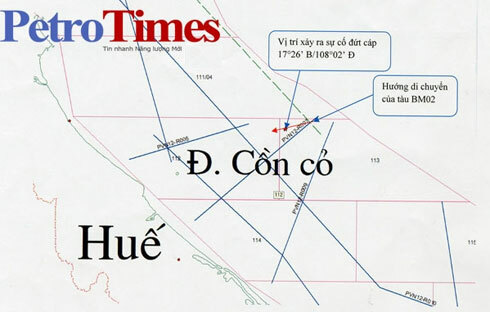 According to Trac, before a series of actions of China, such as the establishment of Sansha city, "the realization of the U-shaped line" or cutting the cable of Binh Minh 02 ship on November 30, the Vietnam Fisheries Association has sent a petition to the Ministry of Foreign Affairs. At the same time, through its system, the association guided its branches in provinces to organize their fishing boats in groups for offshore trips in order to help each other. According to the association, the relevant marine forces of Vietnam need to monitor the activities of Chinese fishing vessels. If they enter the exclusive economic zone without permission, it is necessary to prevent and expel them. Besides, the association also continues encouraging fishermen to firmly hold on to the sea and their fishing ground; through that contributing to the protection of Vietnam’s sovereignty over the sea and islands. Commenting on the actions of China, Hoang Viet, an expert on the East Sea, said that the strategy to realize the "U-shaped line" of China is uniform from the top to the bottom. Therefore, all of its agencies when making any action related to the East Sea follow the overall strategy. The Chairman of the Office of Foreign Affair Department of Hainan Province (China) told the Wall Street Journal and Reuters on December 5, that the new regulations of the province is its "initiative" but it got the "green light" from Beijing.